Japanese company Kamoi has been producing various forms of adhesive masking tape and washi tape for over 90 years, largely for industrial use. What we now know as MT Tape really began in 2006, after three women approached Kamoi and showcased the beautiful craft projects they’d been making with the industrial tape. 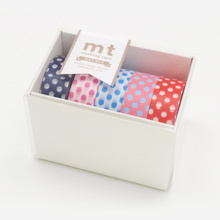 Their visit inspired an entirely new direction and range- MT brand washi tape. Following an exhibition in Tokyo and in their home city, Kamoi furthered the decorative ideas, launching MT Tape with a wealth of single colour and patterned tapes focused on sweetness and functionality. The company continues to feature exhibitions that continues to expand the possibilities for MT Masking Tape. New designs are at the core of keeping this brand fresh and fun. 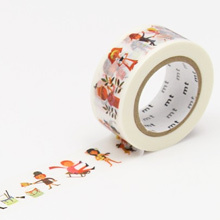 Beautifully packaged, thoughtfully produced, MT Tape elevates adhesive tape from everyday stationery to a unique and surprisingly versatile, art, craft and design object. Whether for wrapping, crafting or decorating, the designs of single rolls of MT Tape seem endless. Block colours, florals, graphics, geometrics – something for all tastes and styles. Grouping together complimentary colours and designs, MT Tape packs comprise attractive sets that are ideal gifts or for easy projects. Working with international artists, illustrators and noted designers, these limited edition ranges aim to deliver ‘surprises and impressions’ on small tape. 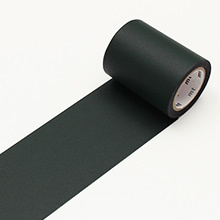 New to the Masking Tape MT range are these rolls of blackboard tape. Perfect for making labels on bottles and jars, or attach a strip of this tape for an instant noticeboard or to-do list in your office. MT Masking Tape helps unleash creativity and deliver colour into any application. Telegram Co. is the official, exclusive distributor for MT Masking Tape in Australia and New Zealand. 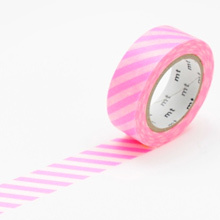 Interested in stocking MT Masking Tape? Please complete our retail partnership enquiry form.